This is a guest post by Jon Freise, a software engineer living in Minneapolis, Minnesota USA, and member of the Twin Cities Energy Transition Working Group dedicated to shifting away from fossil fuels. I wanted to explore the recent history of natural gas prices and try to see what patterns existed and if those patterns could help us predict future prices. In this article I lay out an argument that the price spike of 2001 led to the price spike of 2003. And that our recent spike of 2008 will lead to another spike in 2010 (possibly made worse by the credit collapse). After reading Jeff’s pieces I was uncertain what I believed about volatility, so I started gathering data by creating a history of the last decade’s natural gas prices. There have been 4 major price spikes. I believe that 2 of these were caused by a spike dip spike pattern. One I believe was caused by Hurricanes Katrina & Rita. (I don’t have enough data to estimate how the first one was caused) Figure 1 shows the spike dip spike pattern. The way it works is that the first spike encourages drilling. The extra production causes a price collapse, and drilling stalls, causing an inventory shortage and the next price spike. Nate Hagens wrote an article about the major natural gas producer Chesapeake cutting capital expenditures. The Marginal Btu - The Return of the Red Queen? Nate discusses how the cost of producing natural gas had been rising as fast as or faster than the price charged. He found Figure 2 (Exhibit 8), which I feel is key to understanding the decision making going on inside the natural gas producers. Figure 2. Credit Suisse Producer cost structure estimates. What I am going to present next is a series of graphs showing a time line of all the factors I could find about natural gas production over the last 8 years. I want to give you a chance to study the data yourself before I bias your views with my interpretations. Ask yourself: “why did this drilling trend suddenly reverse?” and “how does this price peak match up with the storage graph?” or “how did producers handle falling prices in this case?” Editor's note: If you find this frustrating, fast forward to "Interpreting the Data", just before Figure 9. In Figure 3 I plotted well head price plus the drilling rate and Credit Suisse’s estimate of North American Natural Gas Breakeven value together because it seemed logical that drilling will slow or stop if it is not profitable. Following the orange drilling line from left to right, in Figure 3, you can see it reverse trend as price falls below the breakeven cost in July 01. Figure 3. Well head price, breakeven production cost, and active drilling rig count plotted against each other. (I want to mention that one factor we don’t have is the maximum flow rate of currently operating wells. Drilling will be increasing this flow rate and depletion will be lowering it. I want to mention it here, because it is worth plotting in your head the increase in flow rate following just behind the Figure 3 drilling rate). Inventory is a useful indicator of how well supply and demand are matching. Figure 4 shows the EIAs “Weekly Lower 48 States Natural Gas Working Underground Storage” plotted against Well head price and the Breakeven Cost. How low or high storage is relative to time of year gives a pretty good idea of why prices are high or low. Notice how low prices in July of 02 match with high levels of storage. Figure 4. Well head price, drilling cost, and gas in storage compared. Figure 5 shows the natural gas consumption by each sector. Drilling gives some idea of production, and Figure 5 Consumption gives a picture of demand. Storage and price should be showing the balance between supply and demand. Figure 5. Natural Gas Consumption by Sector allows estimating temperature and price impacts on demand by sector. Figure 6. Trend lines showing Industrial gas usage falling while electrical generation using natural gas grows. Figure 6 is included to make clearer that Industrial consumption is on a long term decline trend as natural gas gets more expensive. Electrical generation from natural gas is growing even faster however. Electrical generation shows quite a bit of volatility itself. It would be a mistake to leave out some estimate of the damaging impact of Hurricanes. Figure 7 shows a 10 year history of gas shut ins from hurricanes up to 2005. And Figure 8 updates this by providing data for 2008 Hurricanes Gustav and Ike. Figure 7 (labeled 2-3). From [EES 2005] showing the shut in volume of hurricanes. Figure 8. Shows shut in production from Gustav and Ike. Figure 8 is graphed on the same scale as Figure 7 for easier comparison of impacts to Katrina. You now have a large amount of raw data. I recommend taking some time to look it over and form your own opinions as to why the price spikes and dips form. Afterwards, continue on for my interpretation. Here are my views on how the price spike of 2001 turned directly into the price spike of 2003. The short story is that the price spike of 2001 encouraged producers to increase drilling. They went too far and caused prices to collapse. Unable to make a profit on new drilling operations, producers scaled back rapidly. Too rapidly. Flow rates were cut, inventories plunged and prices spiked again. Figure 9. Shows my interpretation of how the 2001 and 2003 price spikes are related. In Figure 9 at arrow 2, the drilling rate increased. I think this was a fatal mistake. Prices were still well above the breakeven point but they were heading sharply downwards. At the arrow 5 natural gas producers faced the same choice but instead prudently lowered the drilling rate. This prevented another deep overshoot in 2004 and stopped the spike dip spike cycle from repeating again. It has been conjectured that producers being more conservative in risk taking will increase volatility. In Figure 9 we find evidence for and against this theory side by side. At arrow 2 producers were not conservative enough, and caused volatility by not cutting back. At arrow 4 producers were too conservative and did not start drilling soon enough and thus increase volatility. Figure 10 has the needed view of storage levels to better understand the price movements. Figure 10. Shows how storage and price interacted during the 2001 and 2003 price spikes. After the 2001 price spike, producers mistakenly increased drilling too much and collapsed the price. They did not repeat that mistake in 2003. In Figure 9 arrow 5 you can see that they lowered the drilling rate and thus were able to prevent as deep an overshoot. Figure 10 shows that inventory did not fall as far in April 04 as they had in April 01 or April 03. So by not over producing and then over cutting, producers were able to stabilize inventories and prevented the spike dip spike cycle. It was a near thing. A few Bcf less storage and the cycle could have repeated. The natural gas producers managed to balance the market for nearly a year and a half. Figure 9 shows prices were hovering just over the cost of production from 04 to 05 Inventories rose in 05 and that might have started another oscillation in 2006, but the arrival of Hurricane Katrina never gave it the chance. Hurricane Katrina struck at the end of August 2005, doing tremendous damage to the natural gas infrastructure. Katrina was followed quickly by Rita. 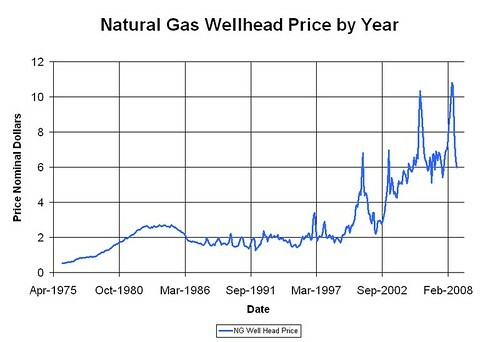 Figure 11 shows that natural gas prices spiked far above the 2001 and 2003 levels. Producers were actually quite slow to increase drilling during this spike. It was clearly unexpected. Drilling did start to pick up, but by then prices were falling back towards a rapidly rising break even cost. Looking at Figure 12 shows that inventories never really fell despite the amount of gas shut in, so it is possible that a fair amount of the spike was fear related or because gasoline costs were spiking. Figure 11. Showing the Hurricane impacts of 2005 and 2008. Figure 11 shows that producers were also slow to respond to the drop in prices. They just kept increasing the drilling rate while inventories remained high and prices were falling. Prices could not be stabilized above break even. From July 06 to Jan 08 drilling rates and prices struggled to balance, both jumping from month to month. Prices began to move up in January of 08. Figure 12 shows that inventory would drop to a rather low level by April 08. Prices continued to rise back to Katrina level highs. Figure 12 also shows that part of this price movement may have been natural gas following oil prices to record highs, because the storage inventory levels never fell as far as in 2001 and 2003. Figure 12. Showing annotated storage movements during the last 2 years and how inventory in 08 compared to 01 and 03. In September - October the banking sector collapsed and the economy with it. Inventory levels rose above the 5 year average and prices fell rapidly. Producers scaled back drilling as soon as prices passed the break even point and drilling rates are now falling faster than any time this decade. Figure 13. Our current drilling rate and price situation annotated and compared to the situation after the 2001 price spike. Despite the rapid fall in drilling rate, inventories are above the 5 year average and the EIA reports that Northeast spot prices have dipped below $5.00 per MMBtu. This is far below the $8.15 breakeven costs estimated by Credit Suisse for 2008. Figure 14. EIA Natural Gas Storage report showing inventories rising above the middle of the 5 year average. Gustav and Ike both struck the Gulf of Mexico natural gas production. The total natural gas taken off line was less than Katrina & Rita and the outages did not last as long. Those impacts did nothing to stop inventories from filling and prices from falling. Clearly domestic on shore production had over produced by quite a large margin. We are now living through another perfect spike dip spike pattern. The 2008 price spike encouraged over production. High inventories will suppress prices. The drilling rate will continue to be cut back which will eventually cut maximum flow rate. By the time prices recover enough to restart drilling, it will be far too late to build up enough new wells to meet winter demand. Inventories will fall and prices will spike once more. Look at Figure 13 and the way prices finally crossed breakeven in mid 2003 on the ramp up to the next high peak. It was not soon enough to stop the price spike. I expect this event again. The only question is how fast the decline in inventories will happen. It took two years from the spike in 2001 to setup the spike in 2003. The last price spike was late 2008, so if the frequency of the pattern holds we may see the next spike in Q1 2010. It would be worth examining depletion rates and seeing if there is some relation between the natural gas price oscillation period and rate of depletion. Part of what may be causing spikes is that rapid depletion rates are cutting flow rates faster than companies have experienced in the past. That mismatch may be the cause of undershooting on drilling levels. Clearly we have moved from a period of relative price stability into a period of great chaos. Could increasing depletion rates be the underlying reason? Excel Spreadsheet: This is a link to Jon's spreadsheet. This is a post for all of us graph groupies. It is interesting to see how past patterns evolved, whether or not we precisely agree with Jon's forecast for the future. The current credit unwind is hitting particularly hard on unconventional natural gas producers. It is also reducing consumption at the same time. This will no doubt have an impact on future production and prices. 1. Transfer function: as stated, this is a typical lagged feedback control loop. Using the standard controls systems engineering tools, you can determine the system response in the frequency domain. This will allow you to determine the system response due to set points and forcing functions. The break-even price is a definite set point that has a y=ax+b function over time y=$, a=constant in $/time, x=time, b=$. 4. Industrial use is falling (although I think this would reduce the spiking rate). I branched comp sci instead of EE and missed taking a control systems class. I have regretted that several times. If you have a bit of time I would be glad to provide the data in spreadsheet form. Just shoot me an email at my profile address. Otherwise, can you recommend a good introductory article? Thanks Jon, I was going to ask if we could get the data set. In our group of EE's and controls systems engineers, I am probably the least talented, but I see the bigger picture and I'll explain the knock on effects. That is, why is this information is important across multiple industries. Natural Gas electrical generation (i.e. best Scotch to wash dishes) has become the baseline cost for many electric utilities. When forecasting electrical rates for long term planning - at least on the West coast - natural gas rates are projected to provide the reference pricing. The LTAP's (Long Term Acquistion Plan) I've seen lately use the EIA projections; and we all know the track record on either USGS or EIA prognostications! I believe the real deterministic near-term and longer term trends lie in the empirical data sets you have presented. Therefore, I got the ball rolling this morning after reading your report to bring in our control systems and signal systems engineers to produce the equations I mentioned earlier. Producing a multiple regression equation should be the simpler of the two, while the transfer function and control block diagrams will take some trial and error. Furthermore, the inputs to the transfer function may require Convolution transforms to adapt the "signal" waveforms into coherent functions. But, in the end I would expect we will have a set of equations that can be utilized to correlate cause and effect. I like the NG market because it is mostly homogeneous, mostly closed, and decoupled enough to allow independent variables to respond to non-correlated signals. On the other hand, I don't think this analysis practice would be applicable to the oil market for all the opposite reasons. Will email in a day or two once we get a handle on the scope of our analysis and outputs. Again thanks, I've found your reports very informative, and this is probably because you are outside the industry and can look at it like it is a black block (Boy, that's leading right into the Entropic Principle - whew!). Note that files can be attached to a posting. That would be a good place for a spreadsheet. Good idea. This is a link to Jon's spreadsheet. Excellent presentation Jon. The best graphic representation of the realities of NG production I’ve ever seen. Not much to add other then some fine details on the dynamics you’ve described. First, every drilling decision is based upon a pricing forecast of 10 years or so. Initial pricing is obviously based on present day well head prices. Escalation of the price over the course of the model is driven by pure optimism/pessimism. As you show so clearly there is a substantial time lag in expectations. Your analysis is quit sound but there has been a monumental shift in the dynamics in the last three years IMHO. I’m sure you are aware of the record setting NG rates we’ve the last 24 months or so. There is no mystery that the development of the unconventional NG plays was the cause of this growing deliverability. You’ve rightly pointed out the potential for even greater volatility in the NG market as a result of this rapid increase in NG supply. Ultimately the key element will be the relationship of the pricing model I mentioned above and the production characteristics of the UNG plays. To the best of my knowledge this relationship has never existed in the US NG business at such a significant level. Combining the high initial flow rate of a typical UNG well with the very near term price model has been, and will continue to be, the driving metric of future NG deliverability IMO. The revenue from the UNG wells more than 4 or 5 years out has become irrelevant to almost all operators. This is the more true with public companies. The increased initial flow rates of these wells have come at a high price. Thus the only way to generate a satisfactory rate of return is to recover the cost within the first 2 years or less of the well life. Declining production rates beyond that point, even in a good price environment, offer little incentive for drilling. This is vastly different then past NG exploration environments. Previously large discoveries made in conventional NG fields could generate significant cash flow 5 to 10 years into the future. Even offshore discoveries with their higher operational costs can generate significant net present value beyond Year 5. But that is not the future of NG development in the US today. The UNG plays are the future. Deep Water GOM NG may have some impact also (see below). And thus, IMHO, we’re back to the defining limit of future UNG development programs: a two year price forecast. Though drilling costs will decline as rigs are stacked, companies will not reenter the UNG play until there is a clear sign of such price support. And even in the face of significant price increases I’m concerned we won’t see a very quick response for several reasons. First, there will be fewer players. In the next 12 months or so we will likely see a significant contraction in the number of players. Acquisition of the weak by the stronger will be the most likely mechanism. Second, companies won’t expand their efforts as quickly as we just witnessed IMO. The current price collapse has sent a shockwave through the industry it will not forget in just a few years. Third, I doubt the capital sources will be as free with their checkbooks as before. They won’t be forgetting their present sleepless nights either. A lot of capital was borrowed based upon $8 NG. Fourth, there will be a lot less equipment available and fewer experienced folks to run the operations. I forget the exact numbers but both the geological and engineering have grayed significantly. A disproportionally large percentage is within 5 to 8 years of retirement. And one side note on Deep Water GOM NG production. By shear luck a significant amount of the NG production loss from hurricane damage was offset by the Independence Deep Water NG Hub coming online. I seem recall it quickly began delivering almost 1 BCG per day. As damaged production came back on line it added to the excess supply scenario you paint so well. But most here understand that as large as those Deep Water GOM reserves may be, technology now allows depletion at much higher rates then previously seen. I haven’t seen enough detailed numbers to quantify the decline vs. time relationship but it may well happen in the same time frame as the ultimate impact of the slow down in UNG drilling reaches the consumer. Combining that possibility with the worse case scenario of a couple of very high demand winter seasons and we may see a pricing spike/shortage situation on a scale never before seen in this country. Potentially a situation which might force Federal action. Whether such a response by our gov’t helps or hinders the situation is pure speculation at this point IMO. Combining the high initial flow rate of a typical UNG well with the very near term price model has been, and will continue to be, the driving metric of future NG deliverability IMO. I think you have pointed out a key factor. I am rather new to system dynamics, but sometimes faster response times lead to bigger oscillations. When oil associated gas dominated the industry, the prices moved up and down pretty slowly. I think the associated gas provided a huge cushion. No matter how wrong the natural gas drilling companies messed up forecasting, they couldn't drive the system into wild dips and spikes. But now it is like steering a super sensitive race car. Slight adjustments in drilling rate are causing large over or under corrections. Partly I think because depletion is happening faster, and production can now rise faster (since production happens so quickly after the wells are drilled). One question I have: It looks like a 2 month delay is typical between when prices fall below drilling cost and drilling companies actually shift the rate of drilling. This is actually pretty quick in my perspective, but I would like to know a little bit more about how does drilling contracting work? Are rigs guaranteed work for X number of wells? Or X number of months? What kinds of delays are typical between wanting to shut down a drilling operation and it actually stopping? On the flip side, what are the typical delays in starting up operations? Once the rig has been contracted, how long does it take to get on site and drilling? In my experience, our rigs have been time based and its our drilling team's job to keep a rig loaded with a continuous lineup of future wells until the contract is up. Wells then take longer or shorter durations to drill, but in the end we're paying for time, not performance. There are penalties associated with performance out of spec, but within a certain range, its considered acceptable and not managed financially. Then, renegotiations of time based contracts take into consideration the comparable performance between rigs and can reduce or increase pay rate based on past 12 months. Our typical cycle for well development was about 2-3 months between SOR agreement and production starting online, but as long as a company has resources for drilling new wells, the drilling team will find new wells to be drilled, no matter how marginal, if only from fear of being seen as unnecessary if they aren't producing prospects and being reassigned. Management then has to spend time in meetings deciding how many "real" prospects there are before breaking teams down and shifting resources. I'd say that probably takes an additional few months when it becomes apparent that the new wells are marginal at best. It probably takes 6 months from the time that last "good" well was selected to the time the last "bad" well is drilled before things are brought back into balance. My observation from visiting a couple of sites is that the more specialized/state of the art the drilling equipment, the longer the lease is likely to be. BP had special drilling rigs made for them, that were adapted to tight gas drilling locations (need to drill several wells, only a few feet apart, without taking the rig down and put it back together). They had to sign long-term contracts to get them made to order. Chevron was using vertical rigs that weren't particularly specialized. They said they had them on very short term contracts. Horizontal drilling rigs were in short supply for a while. I expect that once companies found one of them, they wanted a little longer contract on them. My guess is that is why we saw usage of vertical drilling rigs peak before those of horizontal and directional. A company will keep its rig until its lease runs out, regardless of how long it is. New to system dynamics? Thought so, Jon. I'm a newbie too, but I was looking for items like "producers' expectations of future profit" and "stock of mothballed rigs" in the model. One thing I've got from John Sterman's textbook (Business Dynamics, McGraw-Hill 2000) is that price is such a derived property that it cannot contribute to the transient dynamics of a system. Another point Sterman makes - how do you know your timeframe is long enough? The rule of thumb is two to three times the longest delay in the system. For gas, I'd guess that the longest delay would be in 'proving' a new field, or perhaps in ramping up rig production. Your questions above about the physical operation of the system are the right kind of question to ask, I think. Thank you for this post. A lot of work. I agree. Looks for stocks. Look for delays. Look for feedback loops. The problem is getting the data. Just an outsiders perspective here, but it seems like what data does exist comes from outside firms doing surveys and data swaps (a bunch of companies all agree to put in data and they get anonymous data out). One of the reasons I do these posts is to try to provide a forum for sharing information. If you come across anything that might help, please do contribute. If you have further ideas of what should be in the model, I would love to hear those as well. I think stocks of rigs before scrapping and stock of skilled labor are key. At some point it would be really fun to build a full dynamic model and I have a copy of Stella just to play with it. A lot of the data you need you can't get from econometric-type surveys. The only way I know how to do this stuff is to hang around (on drilling sites and in board rooms), listening and asking questions. Hard to do, and pretty near impossible if you're not attached to a university (as I'm not). Rockman freely shares his knowledge of how the industry works - that's really cool. He would be a great collaborator if he's willing. Ask away anytime Greg. As you've seen I'm not shy about discussing the nasty underbelly of the biz. I view this world from the low end while others here have a clearer view of the big picture. Right now I'm in the process of shifting to the international theater (gotta keep paying those bills) but I'll still share the coffee pot with the domestic gang so I can keep folks here aware of the daily battles stateside. Sorry for the delayed response (spent a very long weekend on a troubled well site). You've gotten some good answers from others so I just flesh out a few points. Mid-summer 2008: Our geologists were begging the drillers to get more rigs no matter what it took. Oct 2008: our geologists were begging the drillers to get rid of rigs as fast as possible. Dec 2008: Cut 2009 budget from $1.4 billion to less then $700 million. Jan 2009: began cutting 15 of our 18 UNG rigs free. Cost to terminate rig contracts early: $40 million. Since 1 Jan 2009 many 10's of thousands of service company hands and office consultants have been cut loose. (we use the rather benign phrase “sent to the house”). This gives you some sense of the time factor. In 33 years I've never seen the industry react so quickly. Even in the global demand destruction period of the early 1980's it took the industry a year or two to cut back this far. Several reasons why so fast IMHO: 1) A very high percentage of consultants. I'll include service company personnel who work in-house for the operating companies. With two weeks notice an operator could eliminate 20% to 30% of the functioning office personnel. 2) The obvious drop in commodity prices. As I mentioned above with re: to UNG, profitability occurs in the first 2 - 3 years. When NG prices dropped the economics were destroyed virtually overnight. If one had a large conventional NG wild cat to drill they might proceed knowing that, while it might take longer to reach payout, the longevity of the reserves would eventually make it a viable resource. Not with UNG: sell the near term production cheap and there is no profit. 3) The declining credit market: I think this factor combined with the above led to the unprecedented speed of the slow down. Not only were the technical folks throwing the brakes on but also the CFO's. You make an excellent analogy to the volatility (as a driver would over steer an overly responsive race car) of the UNG. Just a WAG on my part but I don’t think we’ll see a return of all those UNG drilling operations comparable to the build up we’ve seen the last few years. Too many folks have had the hell scared out of them the last 6 months and most of those folks will still be running the show in the next few years. Add that to an economy with limited ability to fund such expansions and it could turn into a worse case scenario: increasing demand driving up prices in the face of significant shortage without a rapid industry response to add production. And I don’t want to even try to speculate what the gov’t might try to do to “help” us should that situation arise. I forget the exact numbers but both the geological and engineering have grayed significantly. A disproportionally large percentage is within 5 to 8 years of retirement. That may not be as big a problem as it appears just from the calendar. Since the current economic conditions have caused retirement accounts to lose value, lots of people are delaying retirement. Thank you Gail for all the good editing advice and doing the formatting. You are right, with the credit unwind and companies vanishing faster and faster, it is hard to make any kind of prediction about when/if prices will rebound. It will be good to revisit this topic at the end of the summer and see the state of drilling and nat gas in storage. Typical lagging feedback control loop. I think if you took a broad look at commodities under supply stresses, you'd see the same thing. Although we've only seen the first peak price in oil (due to the even greater lagging feedback), its only the first of many. Given it 50 years and you'll be able to trend up nicely and ignore the peaks and valleys. Like Jim Rogers, I date the secular bull market in oil prices back to 1999. From 1998 to 2008, oil prices rose nine out of 10 years, with the sharpest rate of increase being in 2000, followed by the only down year in the 10 year period, 2001. It will be interesting to see how sharp the 2009 decline will be relative to the average 2008 price of $100. This is a great set of overlays, definitely thought provoking. 2008 stands out a bit in my mind as an anomalous price spike. We see a fair amount of shut-in volumes, but certainly less than Katrina/Rita. Spot price spikes did not attend Gustav/Ike, because electric generation demand was lower year-over-year, and industrial gas demand continued its years long decline trend. The spike that trailed the 2008 hurricanes appears out-of-phase with storage, compared to previous spikes in the series. In short, we got a Katrina-like spike without Katrina-like fundamentals. What happened? My personal hypothesis is a relationship between crude and nat gas, that translates via the paper contracts (i.e., the futures markets). As crude was getting cranked up, traders sold their crude paper to pick up relatively cheap btus in the form of nat gas paper, incrementally bidding the nat gas paper higher. Traders could do this while having relatively little impact on the crude paper because the volume of crude contracts dwarfs nat gas contracts. Essentially, a form of btu arbitrage developed that became reinforcing as crude oil pushed up. The simultaneous collapse of oil demand, nat gas demand, and credit availability resulted in btu arbitrage in the other direction. An interesting overlay, if it exists, would be futures prices and volumes against spot prices. I'm not big on 'speculation conspiracies' and I would hesitate to call this a 'conspiracy' phenomenon, but I think a possible feedback between paper oil/nat gas and physical oil/nat gas deserves a closer look. EDIT: My mistake, the 2008 hurricanes were obviously not germane to the nat gas price spike of '08. This tends to reinforce my main point. There were no noteworthy hurricanes/shut in volumes in 2007, but we spiked in Q108 despite this and adequate storage volumes. A purely fundamental explanation for this seems hard to come by. It seems like the natural gas spike was about the same time as the oil price spike. I wonder if there was a connection. If oil prices are high, natural gas can be a substitute in some cases. In Europe, I know gas is often priced as a function of oil prices. Residual fuel oil to electric generators. These can compete at the margin with natural gas in the Northeast and Florida, and help brake the price. As the high cost of FO6 (which moves with crude) priced these oil generators out of the market, it gave nat gas 'room to run'. But this seems like a pretty small effect next to the sluggish demand that winter, which hit both nat gas and power. Heating oil vs. nat gas. These compete in the Northeast, although I have always viewed it as end-use competition that takes place over a period of years (furnace replacements, new construction) rather than intra-seasonal spot price competition. World LNG. You mentioned a number of countries tie nat gas to crude oil, and I think this is true of Asian buyers as well as Europe. If market participants anticipated LNG as the marginal supply to the U.S., maybe that helped bid up the price of domestic nat gas. However, it was pretty well understood by early 2008 that 2007 LNG demand had been a disappointment despite a lot of capacity expansion. This implies (but does not prove) that LNG was not a price setter at that stage. gas in storage was dragging along the bottom of the 5yr average in q108. One thing that is missing in this analysis is the relative price of oil to natural gas. The high nat gas prices in 2008 were due, in part, to the expectation of future energy shortages. I think there is some linkage between the oil and gas markets and this might be captured by including the relative price (in $/BTU) of oil to nat gas in the model. Terrific post that gives much to think about. Also great comments that suggest possible approaches for systems modeling. No problem. When I saw the post on the recoverable reserves of Gilette being down graded by 50% I thought "I bet Dave is smiling to himself all day!" If you have a student that needs a senior thesis, I would be glad to send over the data. It seems a shame that there is not a better predictive model existing(assuming it does work). The destruction in the industry right now is pretty horrific to watch. That is an excellent analysis--informative and enlightening. Thank you very much for putting it all together. 2) Despite prices falling below production costs, drilling activity continuing to accellerate. This is, to put it quite bluntly, economically perverse. But if we look back over our history, this isn't the first time something like this has happened. Phenomena like this tend to occur in periods of what Kevin Phillips calls "avarice, luxury, arrogance, and debt." The years 1982 to 2007 constitute such a period, reaching a crescendo between 2003 to 2007. Two other similar periods, Phillips says, were the Gilded Age of the late 19th century and the Roaring Twenties. ...a final example: the founding of United States Steel Corporation in 1901. Viewed through Veblen's eyes, the steel combine was a vast social machine for producing steel, an assemblage of plants, furnaces, rail lines, and mines under a common management for their more efficient coordination. But this was only a minor consideration in the eyes of the men who "made" U.S. Steel. The eventual monster company had real assets of some $682 million, but against this had been sold $303 million of bonds, $510 million of preferred stock, and $508 million of common stock. The financial company, in other words, was twice as "big" as the real one, and nothing more lay behind its common stock than the intangible essense of "good will." In the process of creating these intangibles, however, J.P. Morgan and Company had earned a fee of $12.5 million, and subscription profits to underlying promoters had come to $50 million. Altogether, it cost $150 million to float the venture. I think if one examines that period between approximately Q2-2006 and Q2-2008--a period in which gas producers raised money to drill wells that lost money for every MCF of gas that was produced--you will find a similar phenomenon. Note also that this period corresponds to the era of the most extreme lending practices in the making of the housing bubble as well. I'm not sure how Heilbroner defined "real assets", but if he meant what the company could essentially liquidate itself for at any point in time, it is frequently the case that the paper value of the company will then exceed the "real" value based on the assumption that profit is anticipated to rise in the future. When the future no longer looks so bright is when company value falls back on its "real" assets. Drilling at a loss is never a good long term strategy, but in the short term may maintain resource capacity for believed coming rebound. Also, there are many other financial factors in play that making new well drilling to be the least "loss-making" activity., such as taxation, lease agreements, rig contracts, etc. What looks perverse from a distance is sometimes the least worst option up close. You're so right Greg. Lots of factors unseen from a distance. Consider that we dropped 80%+ of our rigs when the price support fell out. OTOH, it cost us $40 million in contract penalties to cut those rigs loose. But quite perversly, the wells we do drill in 2009 might be more profitable then the 2008 wells even at the lower NG prices. Right now the key phrases are "preserve cash" and "max the rate of return". Reserve replacement is no longer part of the conversation. At the risk of sounding condescending, I wish a prereq for any economist would be fundamental physics and electric circuits. Those of the theoretical persuasion seem to have a gaping lack of understanding the physical realities. These things do not instantly turn on and off because of price signals. If anything, economists seem to think in a digital/transistor world, and us guys in the 60 Hz world think in analog. Enough of beating up on economists. To understand the complex dynamics, it works if one stands back and looks at the system as a "black box". That is, I don't care what goes on inside the black box, I am only concerned with the inputs and outputs. All the internal mechanisms will do what they do based upon these signals and their inherent physical properties. I applied this approach to a continuous Kamyr digester for my undergrad engineering project and voila! out popped the system dynamics. This led to the creation of Dynamic Modeling Technology by others, (to repeat, I'm not that clever, but real good at getting others started and staying poor). Now, I used this approach because I was not a chemical engineer and couldn't pretend to understand the reaction processes. However, these pulping units were considered barely controllable all those previous years because engineers were trying to do just that - control from the fine level, and usually get lost in the complexity. "To understand the complex dynamics, it works if one stands back and looks at the system as a "black box"." ... but at the same time you start with the assumption that the system's behaviour is endogenous (arising from within the system) rather than exogenous (being caused by external factors). That's WHY you model the system as an electrical network in the first place. Perhaps Jon could have spent less time looking at exogenous factors such as Hurricanes and credit availability and come up with a better model. Totally agree about the economists. Gosh, I feel like I must be looking at a different set of graphs than you guys. In short, for a theory to go beyond the prevailing neoclassical theories it must be more predictive, and explain more. We accept the claim that a theory must not be excessively complex, but see equal danger in excessive simplification. And, we join those many who argued that tautologies ("near" and complete) tend to be unproductive devices. Above all, we need more induction. Science requires a judicious balance, admittedly fraught with tension, between logical (deductive) and empirical (inductive) elements. Neoclassical work, as indicated by its increasing mathematical nature, has become unbalanced. Statements such as "it's wrong [empirically] but done very elegantly [mathematically]" ought not to be seen as compliments; they suggest that neoclassical theorems have beome a scientific, logical perhaps but not empirically true. Nothing any of you have said explains the empirical data, nor is it remotely predictive. Malthus, Marx, Veblen (particularly) and Mandelbrot all brought valuable perspectives, but Jay Forrester's insight is problably the greatest as well as the simplest. That insight was the importance of "feedback with delay(s)" in controlling the behaviour of all systems. Mandelbrot's insight was the impossibility of precise prediction in non-linear dynamical systems. The only possible predictions are general: "the system will exhibit this kind of volatility in activity." "But when prices plunged in 2006 below production cost, there was no subsequent plunge in rig activity. How do you explain this? " This is explained by the time taken for "producers expectations about future prices" to change. In an uncertain world, everyone learns not to react to every blip and shiver in prices - or they go out of business very rapidly. You wait for a while to see if there is a trend. Jon has started a valuable train of research here. You are very right. (Getting more eyes on the data is why I posted so many of the graphs without annotation.) Drilling rates should have fallen. There were some very odd things happening in 2006 that I cannot explain. Look at Figure 4, Jan 06 to July 06. Storage is at the highest level on the graph yet prices don't drop. They should have gone below 2001 levels. Now, I can guess that the market thought there was more offshore damage from Katrina than really happened. But storage does not fall much over the next winter and yet prices still did not collapse. Nor did drilling rates fall. Why were companies putting in more wells when most were not profitable? The only explanation I can think of is that shale plays were profitable. And they were boosting production when most of the companies surveyed for NG cost data were losing money. One of the pieces we are missing is that our cost data is not weighted by production volume. So it could be that an average in our case skews the statistics and we really need to know the mode or production weighted average. (If you want to help create that send me an email and we can brainstorm how to get that data). Massive amounts of money were flowing into the U.S. from foreign investors up until the summer of 2008. Sure, most of this probably went into real estate. But could have some of it found its way into oil & gas? The complete effect of US current account deficit recycling on the US bond market is difficult to dissect. Generally speaking, it drives risk premiums lower in the US, and creates perceptions of a stronger financial economy than might otherwise be the case. These influences are incredibly dangerous in that they call into question the inferences one might normally make from asset prices. "Here, too, the record is clear: an unusual interest rate environment and heavy foreign competition in manufacturing has changed the composition of investments in the United States substantially toward the non-traded goods sector as manifested particularly in the dramatic increases in the price of residential real estate in and around most major American cities." I think the money flows are important. Also you had a lot of synergy between oil/gas open up both for complex refining of low grad oils (peak light sweet) and moves off of oil to NG for companies that can use both either as fuel or as starting materials. By 2006 NG was quite cheap relative to oil. kick on at a moments notice. Whats needed to see this is price of oil vs NG. I watch this on the weekly NG reports but I don't have the long term trend graph. did not rise all that much rising oil prices created upward expectations in 2006 and put a fairly strong floor on the downward move. "But could have some of it found its way into oil & gas?" without a doubt. look at the ownership of chk and rrc, favorites of the mf's some call mutuals. Qualifier: I have somewhat unique perspective (I guess) because Economics was my minor for my engineering degree. Let's begin with the premise that seems to trip up esoteric economic analysis which is "perfect information". The assumption is given the current data, the individual, firm, or industry should respond accordingly. As presented by Rockman and others, we can see there are complicating factors that may seem to be contrary responses. Sometimes individuals chose to play against the market. Electrical or Systems analysis will account for the natural physical characteristics, (hence, my disparaging previous comment about economists and prereq's). i.e. the current contracts are an inductive force concerning the number of rigs still in production even though the price has fallen below production cost, and the human response to continue production guessing that prices may increase again is a capacitive function. Let's pull back a bit and look at systems in a larger sense. Systems behave with energy inputs and outputs according to a natural inherent rhythm. This may be a natural law worth establishing on the level of Newton's three laws. Nothing new here, it's been said many a time, but maybe it needs to be elevated to the same Pantheon of Newton's Laws. You see, action-reaction is a first order response for simple systems. Now take the classical spring+mass+dampening pot acted upon by an action and you have the reaction of a classical second order response. For all systems, the trick is in modeling how energy, (and information can be an energy element), moves through it. The Natural Gas industry is not any different. As I replied to Jon in a previous post, I like the NG market model for it's characteristic semi-closed nature. As an analogue, electrical engineering enjoys a high degree of determinism due to it's highly closed nature. We have the luxury of being usually much more correct than chemicals or mechanicals because of the inherent physical nature of the system (less external "noise" and less losses - forget what I said for high frequency systems). But to avoid a pi$$ing contest, this is not about hard science vs. economics. Both have plenty to offer in the analysis. The one differentiation I make (after some 20 years of introspection) is that Economics is an abstraction on the physical layer. Both are right, but as I like to throw out there once in a while, "Thermodynamics doesn't give a damn what you think". We'll work out these dynamic equations and put them to the reality test which will providing fine tuning. This is not beyond us gentlemen. You might find these two lectures interesting. ...I would say that we should look at the problems of where does love come from, where does morality come from, how did the biosphere evolve and these are hard problems, let’s get to work. In case you haven't guessed, I tend to be more of a vitalist. This is of course heretical to classical and neoclassical economists. Merton the younger is a representative of the school of neoclassical economics, which, as we have seen with LTCM, represents most powerfully the dangers of Platonified knowledge. Looking at his methodology, I see the following pattern. He starts with rigidly Platonic assumptions, completely unrealistic--such as the Gaussian probabilities, along with many more equally disturbing ones. Then he generates "theorems" and "proofs" from these. The math is tight and elegant. The theorems are compatible with other theorems from Modern Portfolio Theory, themselves compatible with still other theorems, building a grand theory of how people consume, save, face uncertainty, spend, and project the future. He assumes that we know the liklihood of events. The beastly word equilibrium is always present. But the whole edifice is like a game that is entirely closed, like Monopoly, with all of its rules. A scholar who applies such methodology resembles Locke's definition of a madman: someone "reasoning correctly from erroneous premisis." So where matters get confusing is when someone like Merton tries to be mathematical and airtight rather than focus on fitness to reality. [Professor Bernstein] believes that the objectivist theory of knowledge is harmful and destructive. It is not, he says, "an innocent epistemological doctrine. It has dangerous consequences." The message Professor Bernstein urges on us is this: In our reliance on objectivism, we are unleashing a destructive force that distorts reality and undermines wisdom and good sense. Unless it is moderated, it will destroy all that our society deems precious: freedom, democracy, cohesion and stability, and perhaps life on earth. I heartily agree with both positions and have recognized the false Gods of scientific reason. I guess I would be a dualist being both a materialist and a vitalist. However in this particular case the overall empirical data illustrates deterministic relationships can be derived - including hurricanes (step forcing function). For quite a few generations we have been weaned on the righteousness of the scientific process and reason. Through the 30's to the 70's our high priests wore white lab coats with pocket protectors of high office. But I hope personally I have evolved beyond the prevailing orthodoxy with a radical new theory. Some probably think I'm a wing nut, despite the multitude of evidence surrounding us each and every moment. This theory is analogous to the discovery of gravity, yet gravity was always there, no? Einstein proved mass and energy are transformable and my theory states energy and consciousness are transformable. You're doing it right now by reading this post. My very words of this theory are now a part of your consciousness by a complex energy transmission system (that would include my fingers tapping away at the keys!). Does a fish really know of water? And, do we really know of a phenomena until we develop the sensory and analytical tools to bring it into our consciousness? Bacteria, electrons, hairs on the back of a fly? Proving this theory is going to take many generations, but I believe Memmel was starting to hit close to home when he made a statement in a previous subject (to paraphrase) "That the complex system seems to be self organizing." A big component of the E-C theory is complexity, and complexity density. i.e., the human body is a very, very complex system in a dense package and therefore has a higher degree of energy-consciousness transform ability than say a mountain range, although the mountain range has many magnitudes more mass. Getting back to the NG modeling, a loose analogy can be made to mob behavior. The mob is made up of many people each with their own personalities, motivations, emotional states and beliefs, but looking from above there are predictable outcomes of the mob as a whole. If Godzilla were to suddenly appear around the corner, bets are the mob would run in all directions in mass panic. If U2 appeared on the back of a truck and played a spontaneous concert (ala Rattle and Hum), probably 90% would relax and enjoy the show. That is the point of the model and where emotional detachment is necessary. To be flip; inner workings, don't care; whether Rockman has 3 or 40 rigs in operation, don't care, etc. After the first draft of the deterministic models are created, then we start to fine tune it with endogenous characteristics. Multiple sets of models are created to account for the exogenous characteristics. When a hurricane makes a right hand turn after Miami, one pulls out the severe weather models and runs the numbers. The result may, or may not be price spikes or storage depletion based upon the current conditions. It would be great if I could demonstrate the simulator our company has that can run these models. If anyone wants to get up to speed on this subject, there are a couple of good Systems Dynamics text books out there; you will have to brush off your calculus though. (I'll post a recommended book I have on my desk if anyone is interested). Would be interested to hear your thoughts on external factors (e.g. LNG, hurricanes, . . .) which make system only 'semi' closed. Another graph I should have included (because a post cannot have too many graphs!) is this one taking a much longer view on prices. Click for a larger view. These are nominal values, not inflation adjusted, but a large factor of the price increasing has been EROI falling (shale gas horizontals etc). Early on had many frequent low level spikes. It seems to me that the frequency might be getting lower but the amplitude has increased. It looks like the price was about $2 for a very long time. In some sense, a price of $4 or $5 now doesn't look all that dreadful now. It seems like the big thing that has happened since about 2000 is the shift to unconventional gas. It has higher production costs, and is a big part of the reason you are showing the upward stair-step in drilling costs over time in Figure 1 and similar graphs. This is a general characteristic of systems also, Jon - as amplitude goes up, volatility (deviation from trend) goes up even more. Due to feedback with delay, as you know. How does this impact on use of renewable energy, especially the increasing trend of more NG being used for summer electricity peak demand?. It seems that winter heating peak will eventually balance out summer electricity peak. A large increase in wind energy (that gives higher winter peak production) should also put more demand on NG for summer peak. Do you know if their is a very big shift away from either oil heat to electricity or NG to electricity, as these trends would increase winter peaks? I have not looked to see if there is a shift happening from NG furnaces and boilers to electric heat that shows up in the nation wide data. I just completed a fairly large survey of homes and did not find any electric heating. So if the trend is happening, it is not happening the neighborhood I surveyed. Some wood stoves showing up. Some solar systems. This was an older suburban neighborhood. Single family homes. Apartments might have a larger chance of being electric. I do think that it will happen over time if wind power can grow fast enough. Some form of heat is needed all winter in Minnesota and the heating demand matches with wind pretty well. The phenomena of "fuel switching" is now a part of some electric utilities' long term planning. And rightly so, it is being treated as a wild card until more data is available. A WAG on the time line would be a generational change (20 years) unless NG prices shoot way up and stay there for a while. In our hydro-electric provinces (BC,MAN,QUE,NFLD) the electric rates will remain relatively stable compared to fossil fuels which will tend people towards electric heat. I hate electric heat. It's dry, dusting and uneven. That's why we have to protect our NG resources because I like NG heating, cooking, hot showers and BBQ's! Use the electricity for transportation. I have been seeing the price of oil and gas drive large industry towards renewable energy sources such as bio-mass. We have projects in pulp mills and lime kilns to convert their kilns and some steam power over to bio-mass fed. Some are using gas and others are directly combusting in power boilers. I was thinking more of electricity being used for heat pumps to heat hot water and for space heating. In a well insulated , airtight house the problem in winter is too much humidity. Hot water heated by electricity feels identical to water heated by NG. Keep NG for cooking and back-up peak electricity demand. Did anyone here mention natural gas liquids? And are they more closely related to oil or gas prices? If they are more related to oil prices and oil is both high priced and above the BTU equivalent price of gas, then you could have high oil prices causing drillers to look for condensate rich gas even if gas prices were relatively low. Q. These spikes occured during what can now be described as a 'pre-credit-crisis' period. We are now in a period where industries are collapsing and demand has imploded. So the question is how might this affect the 'cycle' that is shown in the graphs above -might it not extend the 'down' period cycle -perhaps make it longer? Yes. How much industrial consumption will collapse? How much residential consumption? I don't have any idea how to gauge the total drop in demand that will happen by next winter. But it is also clear that a lot of needed wells are not going in now. I don't know what to do but watch inventory levels closely this summer and see if we can make it through one more winter on storage and old wells. We could see another spring price spike like in 2008. Electricity - Prior to about 2000 NG was used only for peaking and was not such a big factor. There was a very large growth in NG generating capacity through 2003, and then slowing growth about through 2006. Higher prices post Katrina dampened growth. Before 2003 little to no NG was used for baseline generation. 2004 on at least some was baseline. Prior to 2003, a significant amount of capacity could be switched from residual oil to NG and back. With the growth of NG generation, use of residual oil dropped and the switchable capacity dropped sharply. Coupling - Pre 2004, there was fairly tight linkage between NG and residual oil prices, but that weakened a lot in the last few years, and was very weak during the big oil price run-up in Q2 2008, but even with a large decoupling the extreme oil peak pulled NG prices up , even if far from proportionately. Imports - LNG was also a factor in driving NG prices down post 2003, but by late 2006, prices in Europe were way above USA so LNG imports declined rapidly, and in 2008 were back to about 2002 levels. Pre 2003 annual LNG imports were in the order of 200 to 300 BCF. they peaked about 2005 or 6 at near 800 Bcf. Canadian imports were a larger factor, having been about 18% of USA consumption in late 2002, early 2003. there has been some fluctuation since, but Canadian drilling dropped off sharply in 2007. I haven't checked recently, but would guess that imports from Canada are below 14 % of USA consumption now. Storage capacity - peak capacity was about 3.2 Tcf in 2004, and near 3.6 Tcf now. Injection during the injection season has fluctuated between about 1600 Bcf in the late '90s and near 2400 Bcf in the summer of 2003, to replenish the extreme withdrawal in the winter of 2002/3. Recently 1900 to 2100 Bcf has been more typical. Storage - the biggest cyclical price driver is expected storage at the end of the withdrawal season (typically 20 weeks Nov. thru March). IN feb 2003 it looked like storage mught get so low in the NE that pipelines could not be kept full, and prices in the NE spiked to $18.00 interday, and near $28.00 intraday for one day. The season ended with a reported storage of about 725 Bcf, later revised up to about 830 Bcf. Given the increase in gas heated housing since 2003, it is likely that minimum critical storage was near 1000 Bcf prior to the recent foreclosure crisis. Weather - the winter of 2002/3 was extreme among recent winters, and led to very high withdrawals. Since then we have had a string of fairly mild winters through spring 2006, and only 2 brief severe summer heat waves. Mild weather has kept the system out of trouble more than has drilling activity. Dec/Jan 2008/9 were much colder than the 5 year average, and Feb. moderately colder. However storage has remained high. the economy - I think that when the data becomes available we will see a large drop in industrial, commercial, housing and electricity demand, especially in mid Jan to now, due to the economy. When electricity demand drops, NG capacity is taken off line first. By late Feb, electricity generation was down about 3% y-o-y, which could reduce NG used for electricity by at least 10%. Drilling Mix - as recently as end 2002 only about 7% of rigs were horizontal. By mid 2008 about 30 to 35% were. In 2003, horizontal wells drilled were about 3% of total. In H1 2008 horizontal wells drilled were 20% of the total. While about 50% of rigs total have been taken out of action since the Late Aug/early Sept 2008 peak, only about 30% of horizontal rigs have been furloughed.Something near 50% of working rigs are now horizontal. To understand the impact of the mix change, we need to know average initial production rates and first year decline rates of both horizontal and vertical wells. In 2004, the average decline rate in the USA was about 28%, and almost all wells were vertical. In 2007 people were bruting around first year decline rates for horizontal wells of 50 to 60%. Hmmm. . I can’t find initial production rate averages. Have tried some SWAGS, but nothing I want to publish. Looking forward – NG in storage is now near an all time high for this time of year, due to high production in 2008, and the economic slowdown, and in spite of a harsh winter. Prices are correspondingly low. The recent cut backs in drilling will not likely show up in production figures before at least June, and maybe late summer. LNG capacity, both for world production and USA offloading has increased significantly, Japan’s big Nuke is now coming back on line, and European and Asian demand has been hit by the economic slowdown. Look for a big jump in LNG available to the USA starting about now. Imports could easily go up by 8 Bcf/wk before summer, even with the USA a market of last resort. As a result any early summer production declines will be more than offset by LNG and we are likely to see impending storage overflow by Sept., keeping severe downward pressure on prices. Probably the only thing that could prevent overflow would be a switch of some baseline Electric generating capacity from coal to NG. I haven’t tried to estimate what price could bring that on, but would guess that it would surely happen if NG gets to $3.00/kcf, which is possible. Thanks for this. It is very helpful. Do you have any advice on where to look for LNG prices? It would be nice to have a way to judge what other countries are bidding for LNG and thus when we can expect some to arrive here. I know last spring when prices hit $13 we had some cargoes show up, but those have tried to reexport now that prices have fallen. It is clearly a very complex system with a lot of data to track. Thanks for putting all of these thoughts together. I knew some of those pieces, but not all of them. My impression too has been that the decline in economic activity will tend to delay the next spike. You've done a fairly good job of understanding the natural gas market in your main post, and many of the comments are excellent too. In many ways, your conclusions are not new. There is a saying in natural gas, which is that high prices are the cure for high prices, and low prices are the cure for low prices. I feel there are a few things you have missed. 1/ Impact of LNG...This is one of the big questions looking forward to the next couple of years. There is a LOT of liquefaction capacity under construction right now. Keep a look out for news from Sakhalin 2 (Russia), Qatar Gas (Qatar), RasGas(Qatar), Yemen and Tangguh (Indonesia). Some people think there is going to be a glut of LNG. I think that view is naive. All of the liquefaction projects are running late and they continue to slide to the right. Furthermore, my view is that some of them will not work correctly when they start. People have been forecasting a glut of LNG for a long time, but the experience in recent years has been that there is usually somebody desperate for additional cargos. However, the global economic downturn may change that. I don't know of a direct source for international LNG prices, but in the past I have looked at the UK gas price from ICE as a proxy. The UK needs LNG imports and has plenty of spare terminal capacity. 2/US natural gas has historically been very much driven by winter temperatures. The Climate Prediction Center has all sorts of data for heating degree days. In recent years summer air conditioning loads have also become important. 3/Economic downturns really hammer industrial gas demand. Take a look back at the 2000-2002 period and you will see a big drop in industrial demand. That was the main factor behind the price crash of 01-02. 4/The outlook for North American NG has dramatically changed in the past few years due to the arrival of shale gas on the scene. While the Barnett shale has been a good producer since 2000, it is only in the past few years that we have started to hear about other shale formations that are as promising as the Barnett. (eg Haynesville Shale) Before 2006 NG production had been flat for years but it has recently surged thanks to the shales. You can get dry gas production data from EIA. Before about 2006 the prevailing view was that North American NG had peaked. It still seems that the older plays are in decline. Before about 2002 the prevailing view was that there was plenty of gas in North America and that production could be increased by 50% at a price of about $3 / mcf. This was based on a USGS resource assessment which turned out to be extremely wrong. 5/The production cost for NG is a moving target because it depends on drilling costs, which have risen in recent years due to high demand. 6/ My own view is that a rebound in prices is likely when/if the economy recovers. Drilling is being cut back and Obama's tax increases on the gas industry are only going to make things worse. That should tighten up supply. However, LNG and shale gas could still flood the market. Drilling costs are likely to fall and that will reduce the break-even price for new wells. I don't think we will see another spike like the last one. Yes there are LNG projects in delay, but there are also some projects recently completed or in completion. Given the WW decline in demand, some of this new capacity is excess. In 2007, even Trinidad LNG was going to Europe rather than the USA. Now there is excess supply WW. In 2004 I did some analysis based on the cost of LNG production facilities, tankers and terminals, and given reasonable assumptions about amortization times and cost of money, concluded that the BE price for new LNG capacity would have to be over $7.00/kcf average However the world has a lot of “old” capacity that might welcome much lower prices before shutting in becomes an option.. Already some users are turning away cargoes and accepting only their contract minimums. I believe that there will be otherwise stranded cargoes, and such will be sold on the spot market even for $3.00/kcf, for at least some months. It is these marginal cargoes that I expect to come to the USA. Most of Trinidad’s export went to Spain for the last year or so, and it would be very easy to divert some of that to the USA. Spain’s economy is in dire straits.. I haven’t tracked shipbuilding since 2004, but if all the ships then under contract for construction were built, there are now between 200 and 250 LNG tankers available. ON average, one ship should make at least 12 round trips per year, say 2500 to 3000 total cargoes. 8 Bcf/wk for 6 months going to the USA would be maybe 40 shipments, or maybe 2% of annual world shipments. It’s not hard for me to believe that that share could seek a USA market at recovery of fixed cost only. If the world economy wasn't in such a mess then I would be quite confident that LNG wouldn't show up in the US. There is still quite a bit of residual fuel oil used for generation overseas, and LNG makes a good replacement for that. However, Japan and Spain are both big LNG users and their economies are in collapse so.....we'll see.